Status trackers identify Council review deadlines, Committee meeting dates, and show the movement of your project through our process. 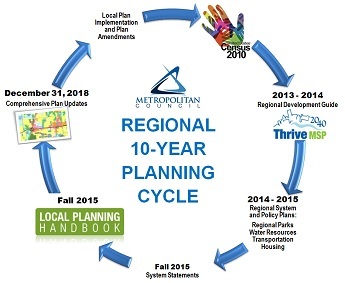 The time line starts when you submit your plan update or amendment online and appears for the 2040 Comprehensive Plan Update and any in-progress Comprehensive Plan Amendments. The Council updates its 30-year forecasts at least once per decade. Forecasts indicate when, where and how much population, household and job growth the region and its communities can expect. Forecasts are used to help plan infrastructure needs and weave consistent growth expectations throughout your plan. These are your recent adopted forecasts. The Need reflects what share of forecasted regional household growth will make less than a set threshold of income and therefore need affordable housing. The Allocation is the determination of each community’s share of this regional need and the first step in helping to determine the housing goals and objectives in local comprehensive plans. The Region’s Total Need for Affordable Housing for 2021 – 2030 is 37,900 units. Minneapolis's 2021 – 2030 Allocation of Need is 3,499 units. Your community-wide household, population and employment forecasts have been allocated based on the wastewater system serving your community. This allocation must be used in projecting future wastewater flows and system capacity to plan for additional infrastructure needs. You can now submit your comprehensive plan update and amendments online! Just complete a quick registration and login and you can simply upload your plan directly to us. The online submittal works for informal plan review, supplemental information, the 2040 comprehensive plan update and for plan amendments. Click for more details on how to use the online submittal tool, requirements for submitting comprehensive plan amendments and comprehensive plan update submittal requirements. Hard copy or digital (CD) submittals are still accepted. Planning assistance grants are made available to assist communities with updating their local comprehensive plans. The Council establishes eligibility to apply for grants to target communities most in need of financial assistance to complete their local plans. Grants are not competitive. Application materials are available to eligible communities now, at metrocouncilgrants.org. First-time users will need to register with WebGrants to access the program materials. Contact Lisa Barajas (651-602-1895) or your sector representative for more information. Applications are due by September 5, 2016. As a new service for the 2018 planning cycle, the Council is offering direct GIS mapping services for Future Land Use mapping to communities meeting eligibility requirements. Our aim is to assist communities with fewer available resources, offer the expertise and time of our GIS staff (free of charge), and focus on mapping Future Land Use for the Local Comprehensive Plan Updates. A population of less than 5,000 people. Map of Communities Eligible for mapping services. To apply for this free service, a letter of intent is required. Use the Sample Letter of Intent for your convenience. Your Sector Rep is the point of contact for this service and will be able to answer any questions. The 1995 Livable Communities Act (LCA) funds community investment that revitalizes economies, creates affordable housing, and links different land uses and transportation. LCA’s voluntary, incentive-based approach leverages partnerships and shared resources to help communities achieve regional and local goals.